If you want to know how beautiful and wonderful Sydney is, I am pretty sure you will find plenty of resources on the internet. Sydney is a great place to live after all. But, although Sydney always ranks as one of the top livable cities in the world, there are lot of things I hate about the place. And I am actually pleased to find out that I am not the only one who thinks like that! There are many articles on the internet externalizing feelings of hate for the city. Many of them are written by Australians who are – or were – living overseas. I must admit that I didn’t find many complaints coming from foreigners living in Sydney, but it didn’t surprise me. It is so much easier to criticize the place where you are from instead of the place you chose to be your home, isn’t it? The grass isn’t always green on the other side. Tired of all the same flattery about Australia everywhere, and after reading some quotes about what people hate the most in Sydney (and agreeing with many of the things from the list), I have decided to share my own top 5 things I really dislike about the city. 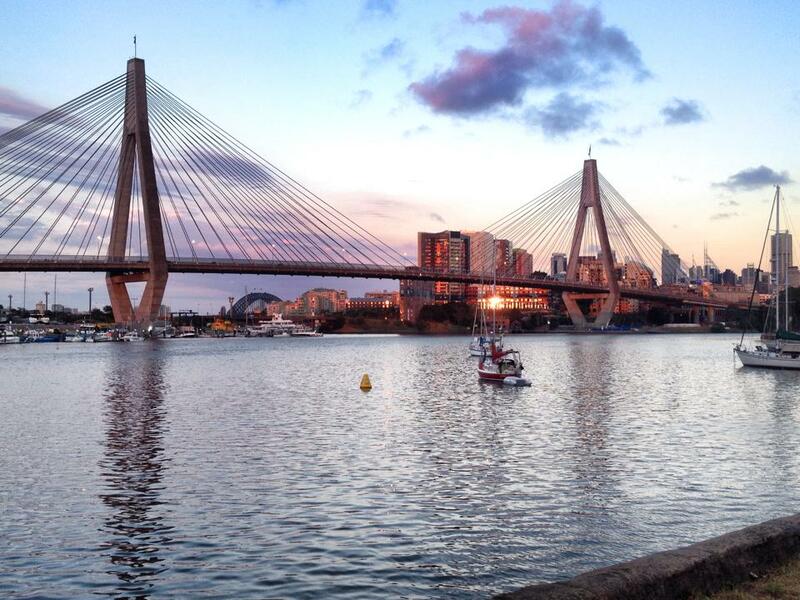 Sydney is awesome, yes, but we have to admit that there is no perfect place in the world. It is always windy. It doesn’t matter the season. In the country, with so poor natural ozone protection, the wind is so strong that it is impossible to use big umbrellas on the beach. I had a sore throat for one month when I first arrived in Australia just because of the wind! 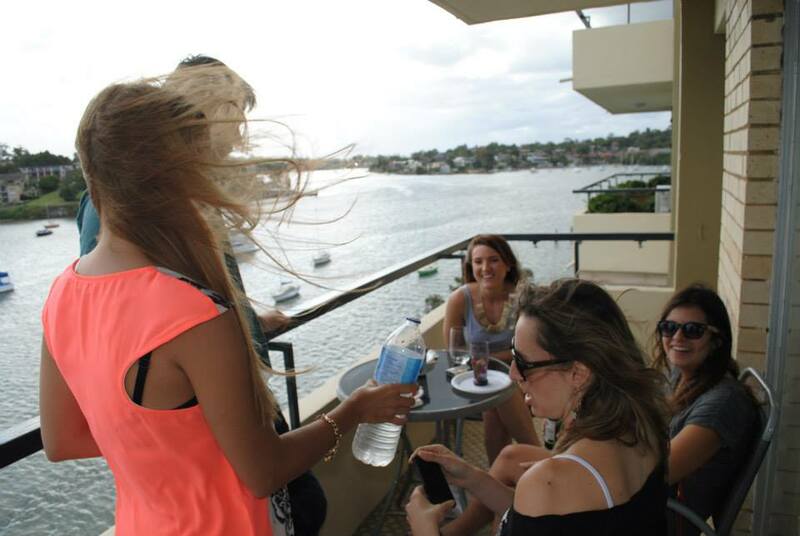 I also don’t know why I bother to straight my hair to go to a party. It is particularly difficult to take pictures outdoors. Ah, and good luck hanging your laundry outside on a windy day. It goes together with the first point. In winter, the wind is not only strong but also extremely cold. Since the traffic lights always take forever to change for pedestrians, it is very painful to wait to cross the road when it is cold. Do I need to mention the hair again? I have a love/hate relationship with Sydney in summer. I love it because… well, it is summer! I hate the fact that everything gets so packed. It is impossible to walk quickly in the city, and it is even worse to go to or come back from the beach. 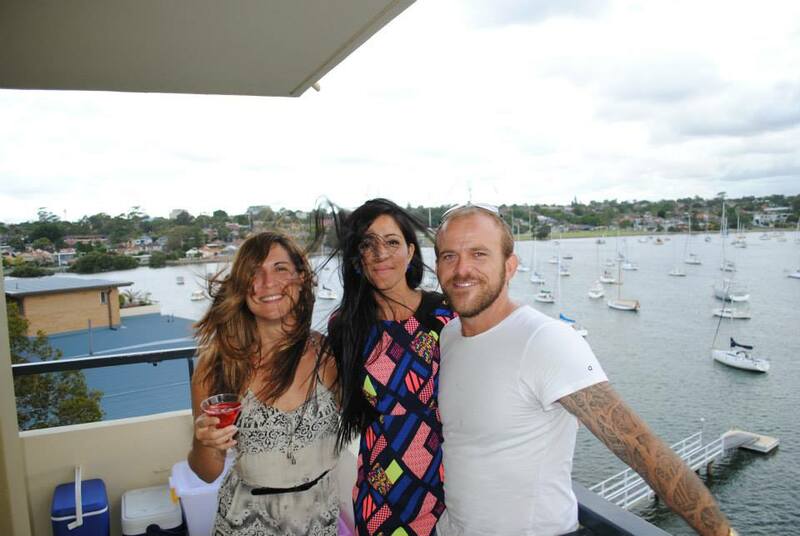 I lived in Bondi once, and believe me Bondi can be pretty stressful in summer. Need to take public transport to or from the beach? Be ready to wait in long and messy queues. Are you driving? Good luck with traffic and finding parking spots. Buses to Bondi are always full in summer. It doesn’t matter if it is 3pm or 3 am. 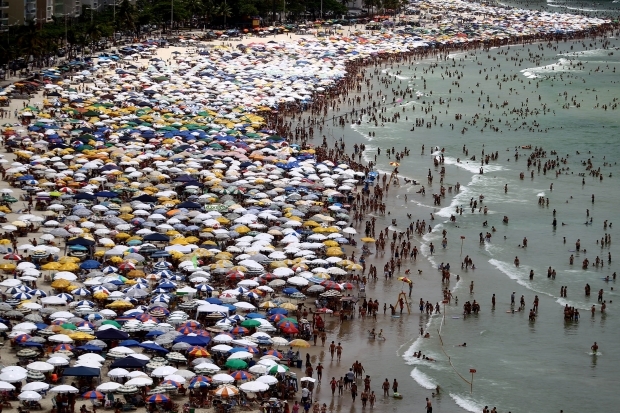 Just for the comparison: Guaruja beach in Sao Paulo in summer is as packed as Bondi. But they can at least use the umbrellas for sun protection. 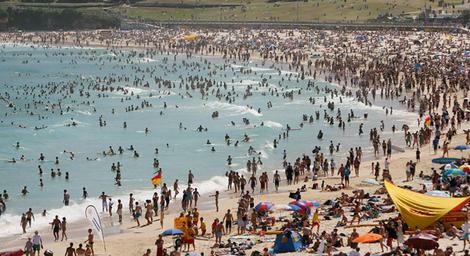 Bondi beach perfectly packed in summer. Photo: Sydney Morning Herald. I find the new Westpac commercial “Australia doesn’t close at 5 anymore” very funny. Everyone finishes work at 5 or 5:30 pm, but the shops close at 5 as well. So, if you work until a bit later and need to do some shopping after work, forget it. The only day the shops are open late (9:30 pm) is Thursday. This is perhaps what I hate the most in Sydney. Of course there are exceptions but generally taxi drivers in Sydney are rude, don’t put any effort to communicate properly with you, always get lost, and never arrive on time when you book it in advance. They always try to rip you off by taking the longest drive home, making sure they go via every single tol in the city. Even worse: THEY DON’T OPEN THE DOOR FOR YOU IF YOU ARE NOT GOING FOR A LONG DRIVE. Getting a taxi after a party has become my worst nightmare. Even if I manage to stop a taxi (which can take several minutes), the fact that I live only 20 minutes away from the city is enough to make many of them to refuse to take me home. Although I hate a few things in Sydney, the truth is, overall, I don’t really hate it here. There are many more reasons why I, and thousands of other immigrants, have decided to live in this city. And who would blame me for that? It is not difficult to love this city when you can work from home on a balcony with this view every day. How not to love it? This entry was posted in Blog, English and tagged Australia, beautiful views in Sydney, Bondi beach, I hate Sydney, packed beaches, summer, Sydney, taxi drivers in Sydney, tourists, wind, Winter in Sydney. 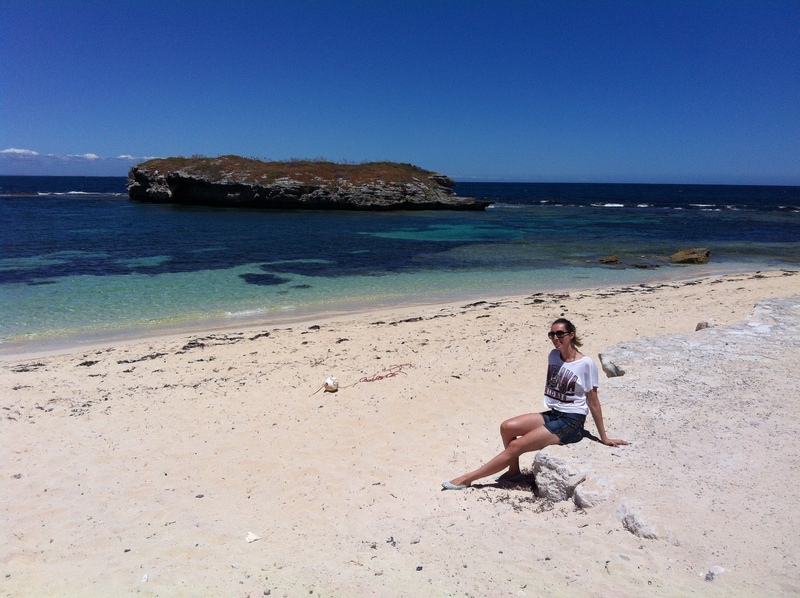 The decision to go to Rottnest Island was made kind of last minute. We knew we wanted to go there this last time we were in Perth, but only decided to plan the trip while we were already there. Because of the Christmas holidays, the city was completely packed. And – so was the island. With no accommodation available, the only option for us was to make it a day trip. The island receives 450,000 to 500,000 visitors per day in summer and offers simple accommodation to only 5,500 people, which means that 70% of its visitors go to the island for the day only. We did and it was completely worth it. The ferry tickets available for the day gave us a late start and we arrived on the island at 11 am, after the 30 min ferry ride from the Fremantle wharf. Rotto, how the island is called by Australians, is 11 km long and although there is a bus available on the island, bikes are the best form of transportation available. We started our tour cycling from Thompson’s Bay towards the lighthouse. Beautiful bays, outstanding blue waters (the ones that only Australia can offer), scenic paths, and wildlife are just some of the features you will find on Rotto. The cycling can be tempered to individual fitness levels and is accessible to everyone. The island is home to a kind of giant rat referred to as a quokka, and you can find them pretty much everywhere around. Quokkas and humans live in complete harmony in this part of the world. 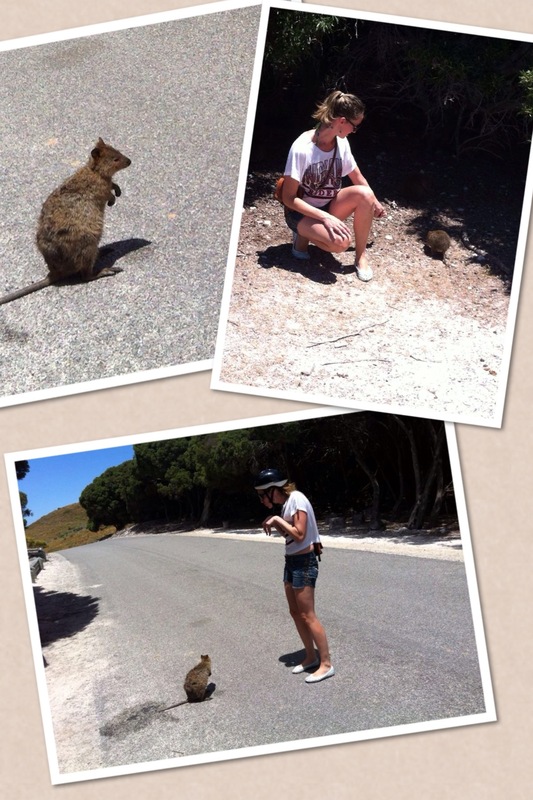 Interacting with Quokkas around Rottnest Island. After visiting the lighthouse, Cape Vlamingh (the western point in the island), and stopping for many pictures; we decided to stop at Parakeep Bay for some swimming, silly magazines reading, and water activities. Although the island was packed, it didn’t feel anything like being at any of the popular beaches, like Bondi or Coogee in Sydney for summer. The bay was completely empty and we could enjoy that piece of paradise all to ourselves. Next to it was George Bay, the closest place for food available, so we headed over there for lunch at the only cafe around that area. After lunch, it was time to join the rest of the crowd. The Basin is the most popular spot on the island and a great place for snorkelling. Despite the fact that the ocean around Australia is very cold and I always struggle to hit the water, the color was so blue and the weather so hot, that even I ventured in for a swim. The snorkeling was beautiful and I could see several schools of fish and sea life. I did leave the water with a sore knee and a cut on my left-hand finger after bumping into the rocks on my way back to the shore, but it was totally worth it! Around 5:30 pm, already hungry again after a whole day of activities, we headed to the only pub on the island for some food and drinks. The Rottness Hotel is a great place to finish the day and it is very family friendly. The house features some bands and DJs from time to time, to entertain the crowd. The music generally goes from 7 pm to 11 pm. Since the last ferry was at 8:15 pm, we had time to enjoy the music for an hour before leaving the paradise. Kids and adults were going crazy dancing in this very scenic environment, while watching the sunset. 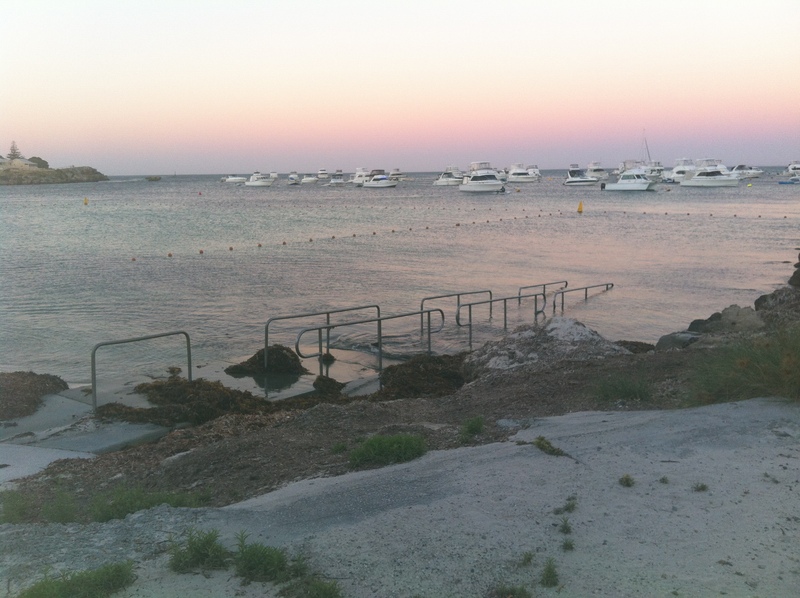 With so much to do, it’s no wonder they call Rotto an island playground. 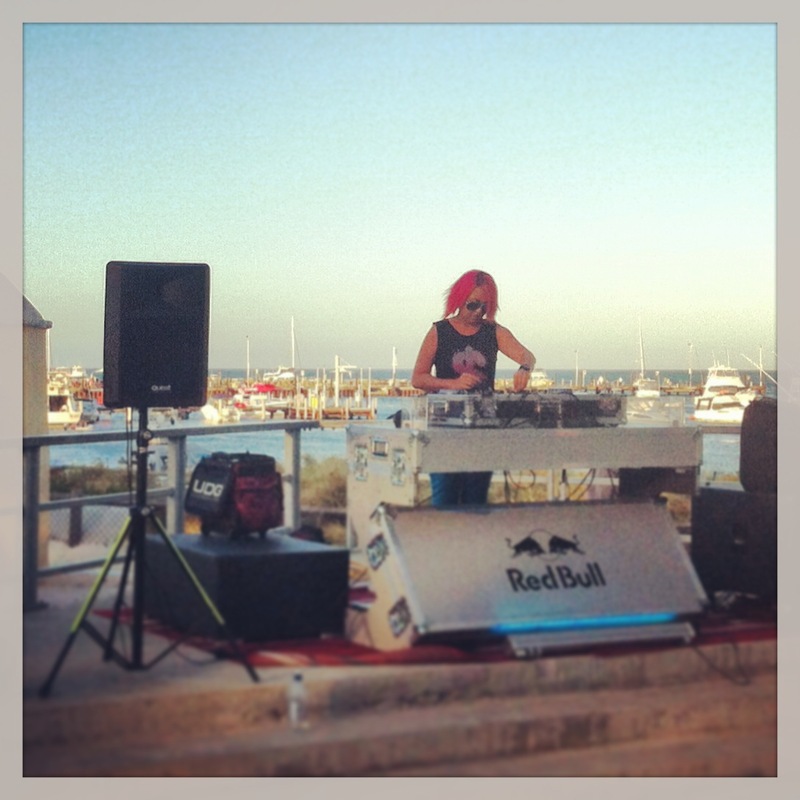 The Dj at Rottnest Hotel. Beautiful views from the dance floor. Sunburned, full of bruises, very tired, and trying to protect ourselves from the cold wind that hit the island at the end of the day, we took the last ferry back to Fremantle satisfied with the great summer day we had. The island is equipped with many disability ramps, including an ocean access into the water at Thompson’s Bay. Sunscreen is absolutely a must and it is never enough. Bikes: you can rent it there, or take your own for an extra AU $15. Helmets are mandatory at all times. Snorkeling gear: I recommend taking your own equipment if you are planning to visit the island during the busy seasons. Snorkeling gear is easily available for rental on the island on less busy days. Water: Take your own when exploring the island. There is no drinking water or shops available in certain points. Keep yourself hydrated. Disability ramp with access into the ocean. This entry was posted in Blog, English and tagged Australia, bay, beach, bike, blue water, day trip, Fremantle, ocean, one day itinerary, paradise, Perth, quokka, Rottnest Island, Rotto, summer, Sydney, wa.